Media and Contents: Tan coloured plasticand clear, Black plastic tyres for roadwheels, two photo-etched frets and markings for three vehicles. 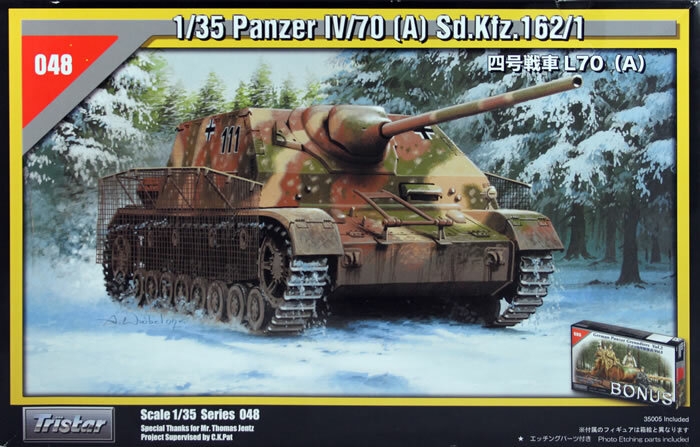 Bill Watt is impressed with Tristar’s new 1:35 scae Alkett Jagdpanzer IV variant.. In July 1944, Alkett was directed to produce an alternative Jagdpanzer IV to the Vomag variant. The Alkett variant was simpler, and consisted of the fighting compartment bolted onto a standard Panzer IV chassis. It was, however, not as effective as the Vomag version and only 278 were made. 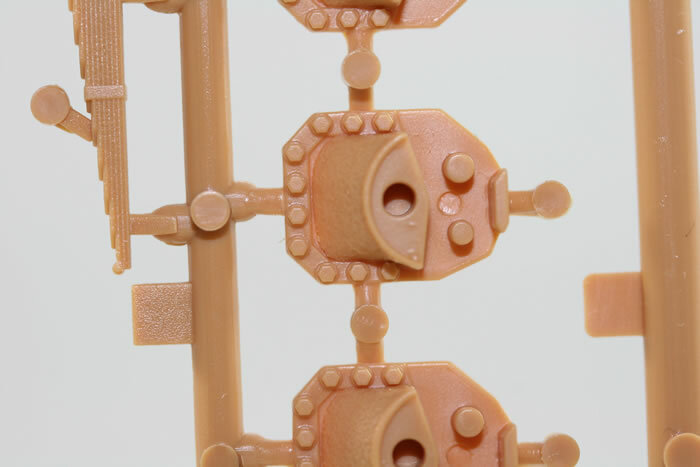 The kit consists of 18 regular sprues, a separate one piece lower hull, two flexible sprues of rubber tyres, a sheet of stainless steel mesh to produce “Thoma” style schurtzen, a clear sprue with periscopes, vision blocks and the main gun sight, and two small photo-etched frets. A paper template to cut the mesh into the appropriate shape is also included. The small decal sheet provides options for two German vehicles and a captured Russian example. The overall breakdown of the kit is pretty conventional - there are only so many ways to skin a Panzer IV. The lower hull is one piece, to which the suspension units are added. The engine deck, fighting compartment, mudguards and front upper hull plate are then added to the lower hull. 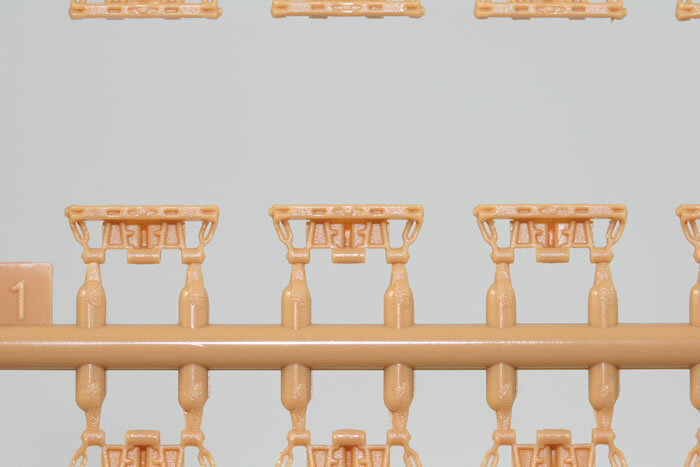 Each suspension unit comprises seven parts (not including wheels), and you need to pay attention to the instructions, as there are three alternatives included for two of the parts. There are some sinkholes in the leaf springs that will be tricky to fix, and the front of the leaf springs are a little disappointing - they are rather coarsely moulded. Having said that, they are almost completely invisible on a perfectly clean tank; add a little dust and mud and no one will be the wiser. The mountings for the suspension have a beautiful cast texture. The bump stops are nicely detailed as well, consisting of a three-part assembly. 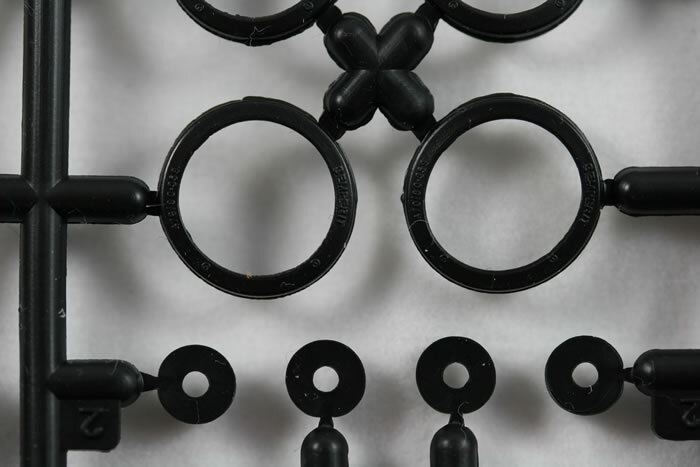 There are four return rollers, and again, pay attention, because there are a number of alternative parts. The drive sprockets are nicely detailed, as are the idlers. The idlers are the earlier pattern ones with a dished disc in the centre. Steel rimmed road wheels for the front four wheels are provided, and separate rubber tires are provided for the rubber rimmed road wheels. The tyres are impressively moulded- the brand name and numerals on them are legible. 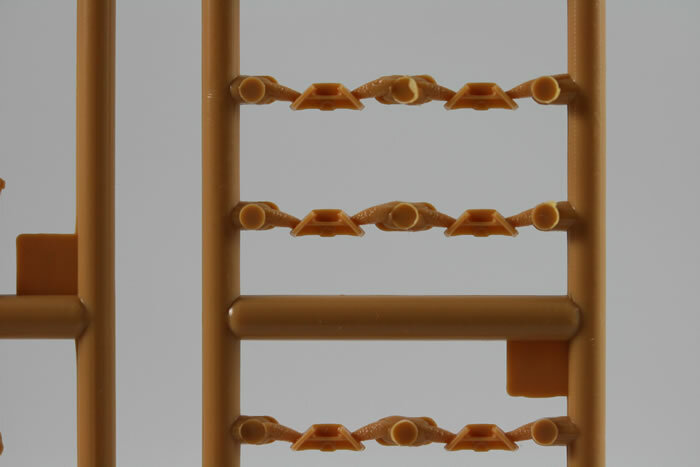 The tracks consist of individual plastic links, and are nicely detailed. Separate ice sprags have been included, which is a nice bonus. 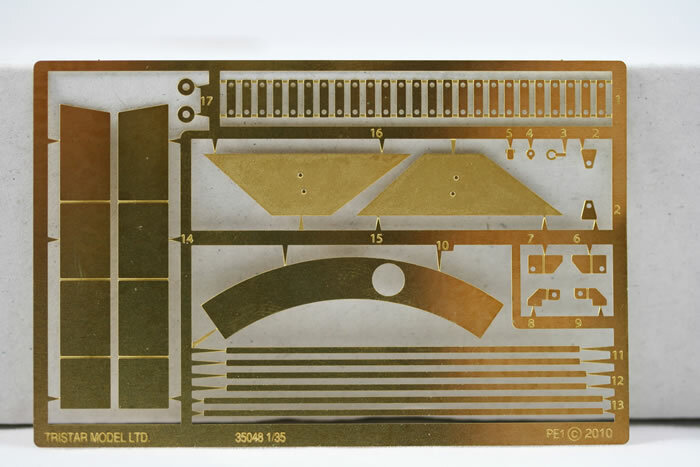 The engine deck has separate hatches and the covers for the side vents are included on the photo-etched frets. The on vehicle equipment and tools generally look good, and the clamps to retain them utilise photo-etched handles. The fire extinguisher is vaguely disappointing - again, it seems to be less refined than the surrounding parts. The jack block has a very nice wood grain texture. The plates have the same interlocking arrangement as the original, and delicate weld beads have been included on the side plates. The 7.5 cm PaK 42 and mount is nicely detailed, but it is the only interior detail included. 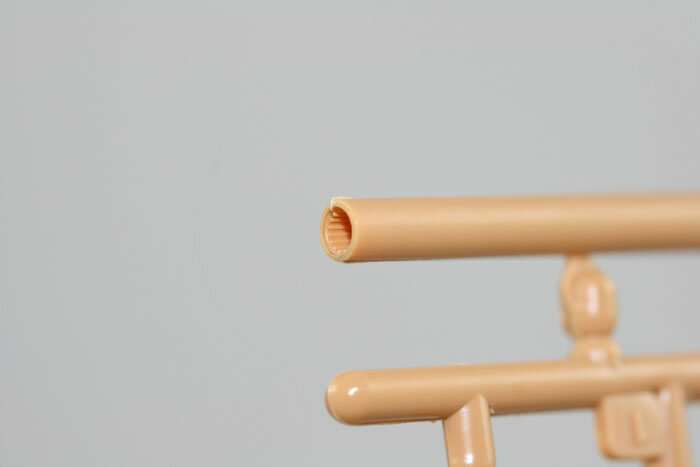 The gun barrel is a one-piece plastic mould, with nicely represented rifling present in the muzzle. 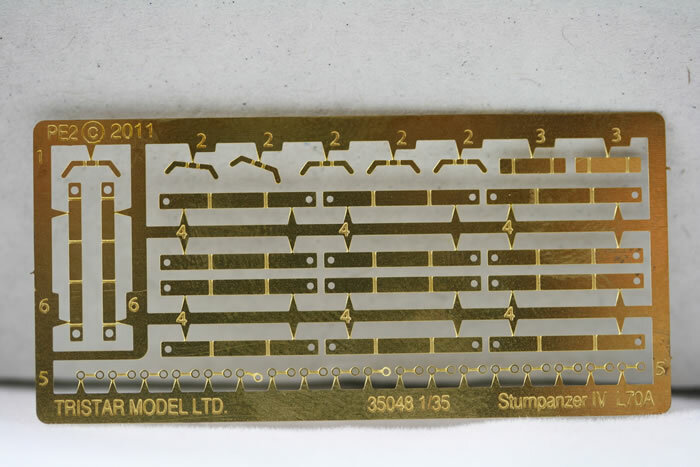 The “Thoma” style schurtzen consist of the stainless steel mesh cut to shape (using the supplied paper templates), to which is attached photo-etched details. The photo-etched frets also provide camouflage loops for the upper sections of the fighting compartment. Tristar has also included figures from their previously released “Panzer Grenadiers Volume 2”. The weapons are particularly impressive. In total, there are four figures, their equipment, 1 MG-42, 3 Kar-98s, 3 MP-40s, 2 GeW 43s, one 9mm Luger and two StG 44s included. Overall, the kit looks really good. 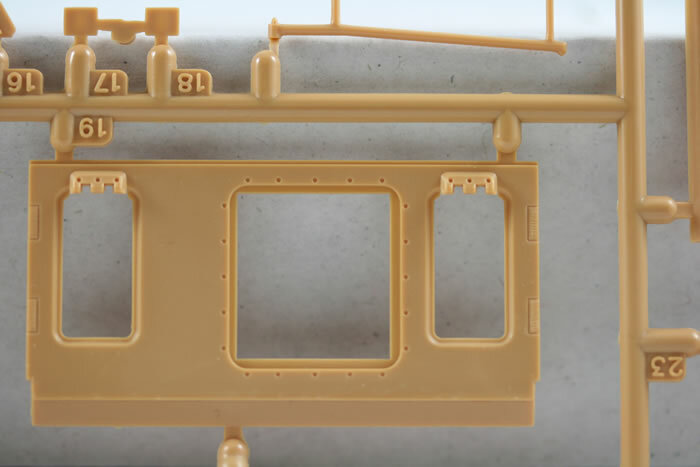 There is plenty of detail, and the design of the kit will make it simple for those who wish to add interior detail to the fighting compartment and engine bay, while still resulting in an easy build for those who would rather build it as supplied. 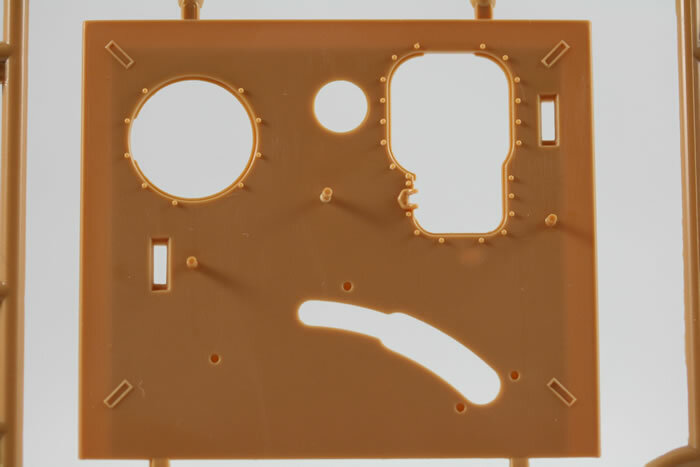 On the minus side, there is occasionally a small amount of flash, no interior detail, the odd prominent mould line and sink mark and a very small number of coarsely moulded parts. Having said that, they are more minor niggles than anything else. I certainly wouldn’t let them stop you from acquiring the kit.